GameBox » News & Event » [Fresh Monday]Yes, the Best Buildup roar item is offered! In this Monday, the best buildup roar item (+100%) is offering for all players by one simple step, you won't miss it! Single payment of 30USD can claim 1 Buildup roar(+100%) item as extra reward. Single payment of 60USD can claim 2 Buildup roar(+100%) item as extra reward. Single payment of 100USD can claim 4 Buildup roar(+100%) item as extra reward. 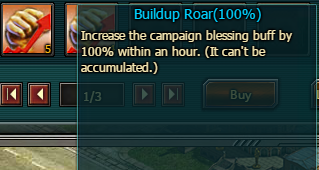 Single payment of >=200USD can claim 6 Buildup roar(+100%) item as extra reward. 1. Each player can claim this item for 10 at most. The reward will be sent out within 24 hours after the event.